Austin: The locomotive was painted to resemble Air Force One, but George HW Bush joked that if it had been around during his presidency, he may have preferred to ride the rails rather than take to the skies. 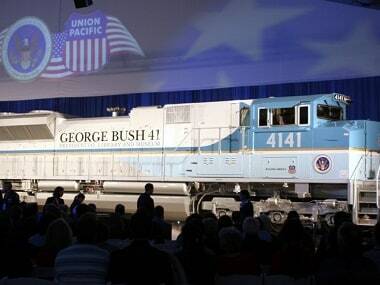 “I might have left Air Force One behind,” Bush quipped during the 2005 unveiling of 4141, a blue and gray locomotive commissioned in honour of the 41st president and unveiled at Texas A&M University. It will be the eighth funeral train in US history and the first since Dwight D Eisenhower’s body travelled from the National Cathedral in Washington through seven states to his Kansas hometown of Abilene 49 years ago. Abraham Lincoln’s funeral train was the first, in 1865. Robert F Kennedy was never president, but he was running for the White House when he was assassinated in Los Angeles in 1968. His body was later transported to New York City for a funeral Mass and then taken by private train to Washington for burial at Arlington National Cemetery. Thousands of mourners lined the tracks for the 200-plus-mile journey. Union Pacific originally commissioned the Bush locomotive for the opening of an exhibit at his presidential library titled “Trains: Tracks of the Iron Horse.” It was one of the few times the company has painted a locomotive any colour other than its traditional yellow. After a brief training session during 4141′s unveiling 13 years ago, Bush took the engineer’s seat and helped take the locomotive for a 2-mile excursion. Bush, who died last week at his Houston home at age 94, was eulogized on Wednesday at a funeral service at the National Cathedral. By evening, his casket was at St Martin’s Episcopal Church in Houston. The funeral train has been part of the official planning for his death for years, Bush spokesman Jim McGrath said. Union Pacific was contacted by federal officials in early 2009 and asked, at Bush’s request, about providing a funeral train at some point, company spokesman Tom Lange said.